China's Shenzhou 9 crew, from right, Jing Haipeng, Liu Yang and Liu Wang, wearing their mission's emblem during training. China's Shenzhou 9 space crew who will launch on Saturday (June 16) on the nation's first manned docking mission — including China's first female astronaut — will wear a dual dragon-emblazoned mission emblem to represent their spaceflight. The three astronauts, or "taikonauts," were introduced at a press conference at the Jiuquan Satellite Launch Center in northwest China on Friday (June 15), the day before their scheduled launch. Jing Haipeng, Liu Wang and Liu Yang will lift off on the Shenzhou 9 spacecraft at 6:37 a.m. EDT (1037 GMT) Saturday, on top of a Chinese Long March 2F rocket. Friday's media conference and the subsequent release of photographs taken of the crew as trained by the state-run news agency Xinhua provided the first clear views of the crew's insignia. 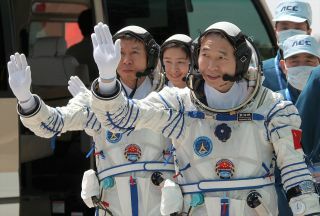 Jing, Liu and Liu donned the circular cloth patch on their flight suits for their public debut. As China's fourth manned spaceflight and the ninth launch of the Shenzhou, or "Divine Vessel," Shenzhou 9 will record several firsts for the country's space program. The crew will attempt to perform China's first piloted docking with an orbiting module and Liu Yang will become the first Chinese woman to fly into space, 49 years to the day after Soviet cosmonaut Valentina Tereshkova became the world's first woman in space in 1963. The red, blue and gold Shenzhou 9 insignia features the crewed capsule nearing a docking with the Tiangong 1, or "Heavenly Palace 1," prototype space station module. The two spacecraft are shown orbiting above the Earth under a sky that fades from dark blue to the bright red of China's flag. The country's national banner is completed on the emblem by the inclusion of five gold stars, which are in the same configuration as they are on the flag. The one large star represents the Communist Party of China, while the four smaller stars represent the four social classes as defined in Maoism. The emblem includes text in both Chinese and English. At the center of the design is the English phrase "TG-1/SZ-9 MISSION" in reference to the Tiangong 1 and Shenzhou 9 craft. The insignia's circular royal blue border, which is outlined in gold, overlaps to form the numeral '9,' in another nod to the mission's designation. Wrapped around each side of the border are gold dragons. The creatures' mouths appear to resemble the two sides of a docking mechanism: one dragon has an open mouth while the other has a protruding probe, or perhaps tongue. The Shenzhou 9 mission is launching in the Year of the Dragon as based on the Chinese Zodiac calendar. In addition to their mission emblem, the crew's spacesuits will also be adorned with the Chinese flag and the insignia of the Astronaut Center of China. The Shenzhou 9 patch that the taikonauts will wear is not however, the only official mission patch. A different logo was designed for China's flight controllers and engineers. The ground support team's badge also forms the shape of a '9' but with a longer tail. The red and gold insignia with blue, white and gray details features a few different scenes from the mission, including Shenzhou 9 and Tiangong 1 docked, the capsule returning to Earth under a parachute and the three spacesuited crew members saluting. The embroidered patch is inscribed in Chinese, including the characters for "Shenzhou." On the emblem's tab is the year, 2012, in Arabic numerals. Continue to collectSPACE.com to see more photos of China’s Shenzhou 9 mission patch.